Energy Program - Citizens for Citizens, Inc. The program assists eligible households pay their heating bills during the winter season or until benefits are exhausted. Clients receive various discounts such as telephone discounts, electric discounts, and gas and oil discounts. Eligibility: Eligibility is based on annual gross household income, family size and annual heat consumption. Income guidelines used are established by the federal government. Documentation Needed: Clients must document a minimum of “4” consecutive weeks of income or any number not to exceed the prior “52” weeks. Proof of residence is required for all applicants by submitting a copy of a current heating or electric bill. Social security numbers are requested of all household members over 18 yrs of age. Proof of housing costs is also required. For renters, please submit a copy of the current lease or rent receipt and for homeowners, please submit a current mortgage statement, real estate tax bill and homeowners insurance policy with annual premium. Households must document US Citizenship or “Qualified Alien Status” for all members. Some examples of documentation are: social security card, birth certificate and/or green card. Please contact our office for a complete list of acceptable documents. Please note: Households that include non-citizens may be eligible for fuel assistance benefits if the non-citizens are “Qualified Aliens” or if at least one member of the household is a United States citizen (which may include a child born in the US). Green cards (INS Form I-551) are one of the documents that establish “Qualified Alien” status for a member of the household. Again, please contact our office for a more complete list of acceptable documents. 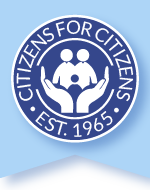 The mission of Citizens for Citizens is to advocate on behalf of low-income residents and address the causes and effects of poverty through the provision of direct and integrated services, the promotion of self-sufficiency, and the advancement of social change.